Happy New Year my lovelies. We’re back from boozing ad piling on the pounds to share with you the exciting tech news of 2009. With CES just around the corner, what can we tell you to whet your appetite for the gadget filled week ahead? -Geek Sugar wants to help you shed that Christmas poundage with a round up of the best fitness games for getting you in shape. I’m not sure how Lips made the grade, but I guess if you move and sing that’s better than sitting. -We got excited about a possible pink iPhone last week, and now it looks like there may be a red version on the loose. No, Gizmodo proves that it’s a fake. Oh well. –Engadget tells us that Lenovo is adding a slightly larger than usual netbook to its range, the Lenovo IdeaPad S10. It has a 10.2 inch screen, and is packed with the new LeovoSocial features, which includes a suite for social networking enthusiasts. This seems to mean facial recognition, a multi touch trackpad and choice of five funky colours. -The credit crunch may have hit us hard, but it seems the Beckhams are still swimming in cash. What did their baby boy get this year? Well Born Rich tells us that Brooklyn Beckham got a £50,000 Porsche from his parents. 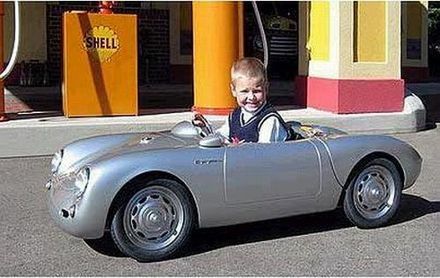 A TOY Porsche may I add.